I get questions from people about gardening here and there. Every time someone asks me a question I feel so unqualified to even answer it because ya’ll.. I know as much about gardening as you do. I swear. I feel like people think I know how to garden because I have one. It is all trial and error over here. Ill give you my “secrets” to gardening. We will start with picking a spot to plant a plant. I plant from seeds because I can get a huge variety of vegetables, herbs and flowers if I buy them as seeds. I love purchasing seeds from Baker Creek. I have tried to start them indoors with a pretty low success rate. Patience is not my strong suit. I don’t take my time in slowly introducing them outside and the environment change can be too much of a shock for certain plants. After you’ve purchased your seeds you need dirt. Good dirt. TLC or Minick carry Garden Ready Soil. We chose to do raised beds. We placed black plastic under the raised beds, then filled our beds with Garden Ready Soil from Minick. 5 tons of it to be exact. That is no lie and we underestimated the amount we needed for sure. We have 400 square feet of garden beds. You are supposed to fill them 8”-12” deep but some of ours only have 6”. Next plan out your seeds. Thats where you pop over to Baker Creek or wherever you are suppling your seeds from. In Oklahoma a few things that have grown well for me in multiple seasons are basil, cilantro, parsley, onions, okra, cucumbers, beets, carrots, butternut squash, spaghetti squash, zinnias, marigolds, pumpkins, sunflowers and watermelon. I am sure there are plenty more but these are the ones I have had success with. Here is a link to a video on companion planting in Oklahoma and here is a pdf as well. Grab a piece of paper and pencil and map out what you want to grow, order those seeds then put them in the ground after the last freeze! That is usually in April for me. Add some drip hoses. These are the ones we use. Trust me, this alone will change your whole gardening experience and success rate. Make it easy on yourself and get those hoses, set your timer and water your garden 30 ish minutes per day. It is also worth mentioning that in other spots in our yard I have played around with Landscape fabric and literally placed it right on top of freshly tilled soil and have had huge sunflowers grow and several pumpkin vines come to fruition. That landscape fabric is heavy duty and chokes out the grass and weeds below it. For most vegetables, herbs and garden flowers you will want a spot with lots of sunlight. Plants need good soil, water and sunlight. See! Easy enough. Weeds will also come with soil, water and sunlight. Sometimes they grow even better than the vegetables you planted if you let them. There have been a few times I can’t even see my smaller vegetables because the weeds are so rampant because, life. We went to Colorado twice this summer and when I returned home the weeks had grown 18”. That is insane! Luckily weeding is a form of therapy for me. This year when Charlie would go down for a nap I would grab Mia and a popsicle and head to the garden! She would play in the backyard while I weeded with the baby monitor next to me and I would get a tan and weed the garden a little bit until Charlie woke up! I definitely did not do this everyday but one or two days a week was good for my garden and good for my soul. One of the harder parts of gardening, for me, is bugs. This is an area I can currently trying to learn more on but so far this is the knowledge I have acquired. When you plant the bugs will come. Insects you have never seen in your life come because you planted a food source for them. There are organic non-toxic ways to get rid of these pests. First, we purchased lady bugs and praying mantis from TLC as a natural predator. These two insects will work on eating some of the bad bugs while not hurting you or your plants. You should wait until your plants are at least 8-12” before getting these helpful friends. Win, win! Next, you can purchase diatomaceous earth and sprinkle it on your plants. You should wear a ventilation mask and sprinkle it on the plants on a low to no wind day as this can be harmful to your lungs. This works to break down the exoskeleton of tiny bugs that will cover and destroy your plants. This can also be used in your yard if you have an ant problem. The next thing we have used that has saved some of our plants is neem oil. Spray the base of the plant in the evenings. If you spray during the day the mixture of the neem oil on your plant and the sun blaring down can bake your plant. Spray when the sun has gone down. Lastly, I feel the need to say I have learned little tid bits of information year by year. I did not wait to start a garden until I felt like I knew everything there is to know about gardening because that will never happen. I started with soil, seeds, sun and water and then learned a tiny bit each year. Every season I have some plants that do amazing and some that don’t make it. We did our first raised bed four years ago when I was pregnant with Mia and have done one each year since! It is rewarding and complete therapy for me. If gardening sounds like it would be more of a stress than a therapy for you you should support your local farmers by heading to places like Urban Agrarian in you live in OKC/Edmond or hit up the local Farmers Markets seasonally. Cheers! This ramen. WOW. As fall swings in with an occasional cool breeze I start dreaming of warm cozy meals. One of my favorites is ramen. Specifically, Spicy Miso from Goro on 16th street in OKC. I might need to play around with subbing the chicken in this recipe for meatballs and adding some corn and bamboo shoots, but today I went right along with Half Baked Harvests Thai Chicken Ramen. 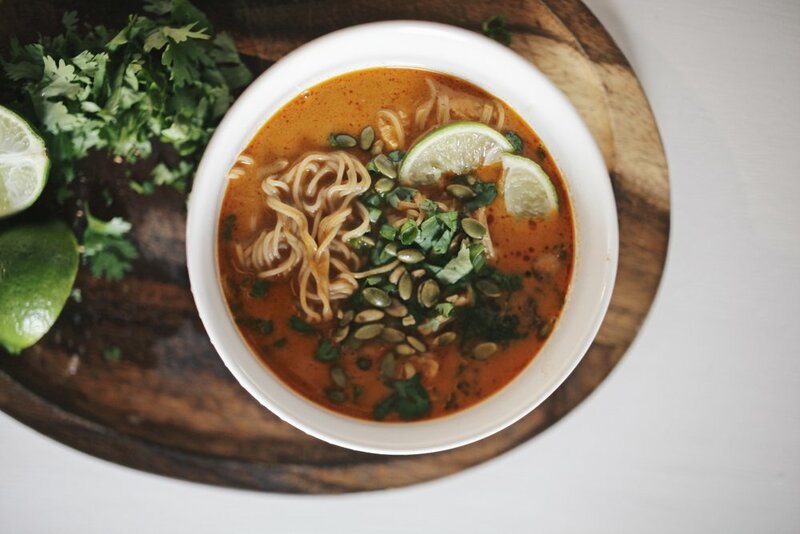 Her pictures are much prettier than mine but I am working on it ;) She calls this recipe “30 Minute Thai Peanut Chicken Ramen” and when she says 30 minutes she means it. It took me almost 30 minutes exactly and I had the help of crying babies, needy dogs and while trying to also get pictures for this post. I bet you can throw it together in 15-20 without a problem. Another awesome thing about this recipe is while the ingredient list is semi long all you have to do is grab those items and throw them in your instapot . If you don’t have an instapot you need one! It is the perfect “welcome fall” gift to yourself. I went back and forth on this kitchen item for a long time and now that I have one we use it ALL the time. 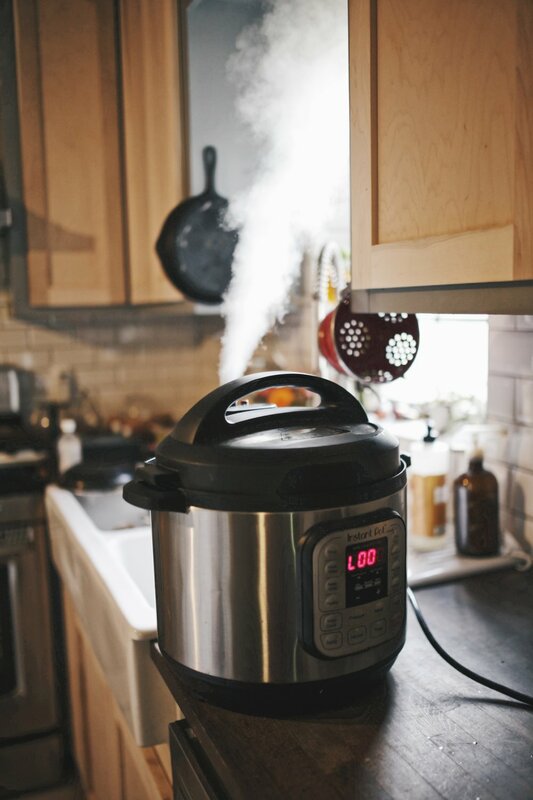 It’s similar to a crock pot but instead of setting your meal and returning to it 6 hours later you can make frozen chicken in less than 20 minutes.. amazing. You can also choose to leave it on the warm setting for several hours and it can act like a slow cooker. It is a wonderful addition to my kitchen. Back to the recipe. The broth in this ramen is thick, creamy and so filling. My husband is an avid hunter and uses most parts of the animal he brings home. We have jars on jars of homemade venison, hog and chicken broth in our pantry, which made this broth especially good. For me it is easiest to read through and gather the ingredients from the recipe that I will be using all at once. It's less back and forth to the fridge and pantry. So clear off a spot on your kitchen counter top and get to gathering! 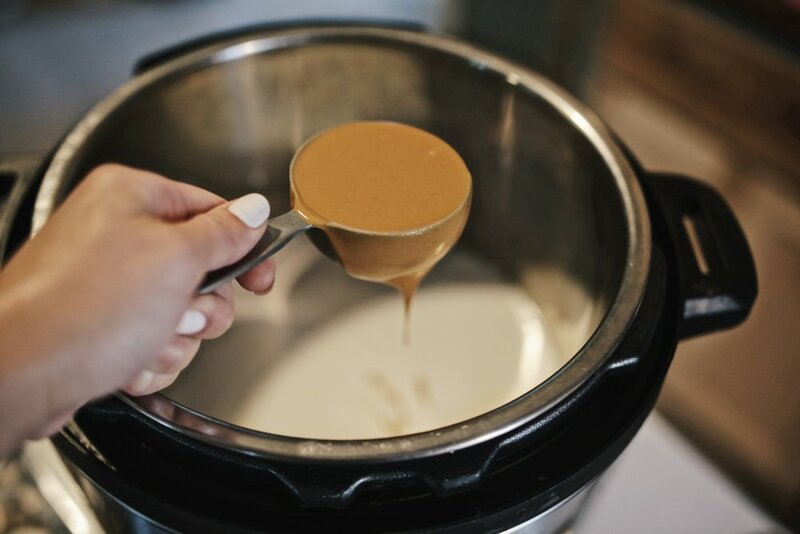 Pour the broth, coconut milk, soy sauce, fish sauce, honey, peanut butter and red curry paste into the instapot. Next, throw in your raw chicken into the pot. I used frozen breast tenders and add a few minutes to the cook time. Now for the mushrooms, peppers, ginger and garlic. Place the lid on and set to high pressure manual for 13 minutes if your chicken is frozen and 10 minutes if thawed. Once this step is done you can do a quick release to release the steam and pressure. Remove chicken. Let sit for 5 minutes cool and then shred it. Throw chicken back in. Add in noodles, lime juice and kale or spinach. These noodles are gluten free and delicious. I love noodles and there are so many different kinds to choose from. These have the perfect texture and hold up well in this ramen. I purchased mine from Sprouts. Set to sauté and allow this to cook until noodles are done which should be 5-7 minutes. Toss some in a bowl, garnish and dig in! See! So easy! Can you do this on the stove top? Of course! Do the same in a large soup pot and bring the ingredients to a simmer and let sit for 15 minutes or until chicken has cooked through. Once this step is done remove chicken. Let sit for 5 minutes cool and then shred it. Throw it back in. Add noodles, spinach or kale and lime juice. Continue to simmer for 5-7 or until noodles are done. Toss some in a bowl, garnish and enjoy!